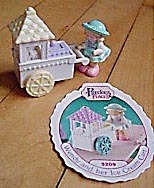 Description: This one-year-only set includes a Precious Places® girl figure, a personality card for her, an adorable ice cream cart that really rolls, a magnetic key, and a straight piece of sidewalk. The sidewalk is slightly raised to allow the Precious Places® magnetic key to fit under it and move the accessory figure and cart around. The figure has a magnet on the bottom that follows the magnetic key, causing her to appear to "come alive" and move by herself. Designed for children ages 5 years and older. FPT19005 - Wendy - Precious Places® female figure wearing a knee-length aqua dress with white trim, long white sleeves, a pink belt, and a pink heart on the chest. She is also wearing a round aqua-green hat with molded flowers on top of the rim and a molded bow in the back. She wears pink shoes and has blonde hair in pigtails under her hat. Her arms are down at the shoulders to elbow and her hands and forearms are outstretched to push her ice cream cart. She has a small round magnet on the bottom of her shoes and is marked "©88 F-P, CHINA" on the back of one shoe. Measures 1-5/8" tall, 1" wide. 7/8" deep. FPT6838 - Oval-shaped white cardboard personality card that has a picture of FPT6837 Wendy and her icecream cart on one side, and a personality summary on the other side. FPT44267 - White rectangular ice cream cart that has 2 aqua wheels with molded spokes on one end, and a push handle on the other end. The end with wheels has white support posts that hold up a removable roof. The end with the handle has a square hinged yellow lid that covers molded ice cream in the "cooler". The bottom of the cart is marked "©1989 FISHER-PRICE, MADE IN MACAO". Measures 2" long, 1-5/16" wide, 1-3/4" tall. *See "Variations" below. FPT7115 - Squared purple scalloped roof with 4 scalloped sides and a round ball on the top pitch. Each of the 4 sides has 4 molded hearts in the center of the scalloped roof design. The roof fits on top of the FPT6839 ice cream cart. Measures 1" wide, 1" long, 3/4" tall. *See "Variations" below. FPT17211 - Light purple magnetic key with a magnet on one end and a handle on the other end. The handle is marked "Precious Places®" on one side and has an oval-shaped paper litho on the other side (Litho may be missing). The litho has a white background with a picture of FPT6837 Wendy in the center and a picture of pink icecream in a yellow cone on each side. Marked "©'88 F-P MACAO". Measures 5-1/2" long, 1-5/8" wide, 1/4" thick. FPT7116 - White rectangular ice cream cart that has 2 yellow wheels with molded spokes on one end, and a push handle on the other end. The end with wheels has white support posts that hold up a removable roof. The end with the handle has a square hinged light purple lid that covers molded ice cream in the "cooler". The bottom of the cart is marked "©1989 FISHER-PRICE, MADE IN MACAO". Measures 2" long, 1-5/16" wide, 1-3/4" tall. FPT22059 - White rectangular ice cream cart that has 2 purple wheels with molded spokes on one end, and a push handle on the other end. The end with wheels has white support posts that hold up a removable roof. The end with the handle has a square hinged light purple lid that covers molded ice cream in the "cooler". The bottom of the cart is marked "©1989 FISHER-PRICE, MADE IN MACAO". Measures 2" long, 1-5/16" wide, 1-3/4" tall. FPT17095 - Squared yellow scalloped roof with 4 scalloped sides and a round ball on the top pitch. Each of the 4 sides has 4 molded hearts in the center of the scalloped roof design. The roof fits on top of the FPT7116 ice cream cart. Measures 1" wide, 1" long, 3/4" tall. FP5209SET1990 - Complete set in a 7" long, 5-1/2" high, 2" deep box. FP5209BOX1990 (Box ONLY) - Sold in a 7" long, 5-1/2" high, 2" deep box.